It's saturday again! And as we hello to love month. I am so glad February is here 'cause I am really looking forward to summer. Getting ready with outing outfits, beach stuffs and summer look. Before wearing the famous red look during February, let me embrace my rock chic side where I can walk, dance, jump comfortably by wearing this rocking get up. Wearing something like this is very nostalgic for me. Bringing back my college fashion. Underneath everything, I'm a total Rock chick. In my secret fantasy, I'm allowed to wear black and lots of leather and scream to punk-rock and screamo songs like there's no tomorrow. How about you? Let me know your rock chick stories! oh wow i just love this outfit! hoes are amazing and u look lovely!! Great pictures as well! Love your bracelets! Nice outfit. Oh dear you look stunning! I love your booties! nice look dear! love the aztec shirt! love this look! the shorts are so cool! I love everything about your outfit!! In my teen years, I was a skater and punk rock girl. I had pink hair, wore studs and omg, had some horrible fashion disasters lol. Lovely print. I love it, you totally rocked it. Yeah, I am love rock / heavy metal stuff also. WOW, love that Aztec top! Wow look beautiful, blue bic shoe, purse and mailman pink leather shorts! I looove that stack of bracelets! I am also looking forward to summer :) and I'm loving your Jeffrey Campbell's! Hi, you look so stunning ! You are looking good my friend. I want shirt!! Really nice yior look and i like yuor hat. Really love this look! the shirt is perfect, love your style, I follow you.Hope you visit me and follow me back if you like it! Me gusta muchisimo el outfit que as elegido, me parece preciosa la camisa, queda ideal con los short de cuero!! y el toque perfecto con esos taconazos!! You look great, love your shoes!!! Loving the pops of bold color against the Aztec! love your leather shorts and your shoes! This look is gorgeous and I am jealous that it is that warm there - I want to wear shorts! Hey rock chick :) Those leathear shorties are great! Love this look! Love your look. The bracelets are amazing! Maybe if you have some spare time, you can check out my blog. Hey that's a great combo ! I recently did a post about aztec print too, this looks great ! 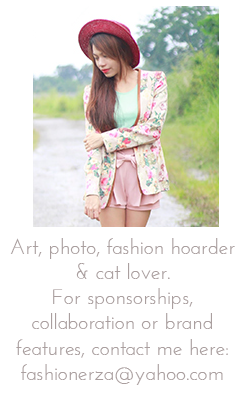 When you get a sec, i would love if you stopped my blog and check my latest post :) Take care. Your atzec top is so awww!Happy Wednesday dear! Come and see my blog and let me know. Your blue shoes are gorgeous too!! such a lovely look!! love this combo! Wow what a lovely outfit! this looks awesome. Thank you for commenting on my blog. I have a GIVEAWAY too you might wanna check it. me gusta tu top! estas genial! Aztec top is sooo cute! cute pics, cute you! love the accessories! This is a really sweet outfit and I love the dream-like editing! I also can't wait for summer so I thought exactly the same when February came! Love those thrifted leather shorts. Great find!